bartlett mitchell complete a sustainability hat trick, named Food Made Good Caterer of the Year for the third successive year. Raymond Blanc OBE, President of the Sustainable Restaurant Association (SRA) presented bartlett mitchell’s Managing Director, Francois Gautreaux with the award in recognition of their continued outstanding level of sustainability. 2015 saw bartlett mitchell add more sustainable seafood and free-range meat to its menus as well as adopt dozens of beehives and fund water pumps in Africa. The SRA hosted the Food Made Good Awards, sponsored by Nestlé Professional at the Royal Horticultural Society’s Lindley Hall to celebrate everything exciting about British hospitality businesses, chefs and suppliers doing the extraordinary to make food good – delicious, ethical and sustainable. 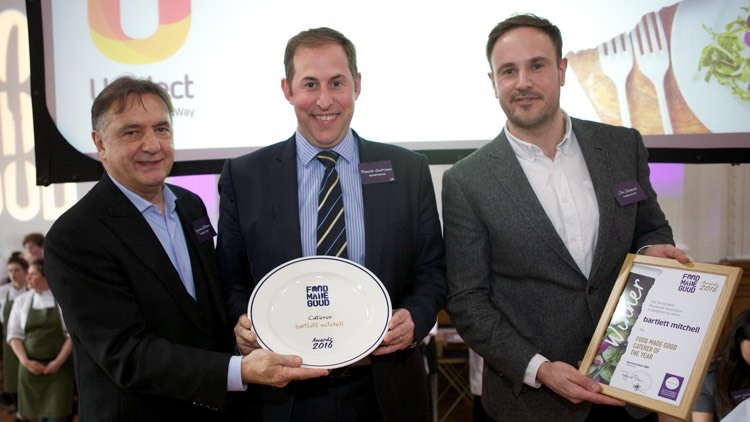 Competition for the Caterer of the Year award was stronger than ever as businesses across the industry upped their game in a bid to match increasing client demands.